Do I Think That Fracking Causes Earthquakes? Note: My analysis presented here is based on what was known about this issue at the time that I wrote this (June 2014). I don’t think the essence of this story has changed (yet? ), but as more earthquakes occur near fracking sites the details of the issue are evolving. These days, I can hardly go anywhere without being asked: “So, tell me, does fracking cause earthquakes?” Not wanting to get into a complex scientific and political argument on the spot (especially in social situations), I generally try to change the subject. But, I guess there’s no avoiding it. Being a seismologist, I do have a responsibility to answer. So, here’s my take on it. Short and simple answer: Yes. “Hydraulic fracturing,” also known as “fracking”, is a method of injecting fluid into the ground to fracture rock for extracting natural gas and oil. Since an earthquake is the release of energy due to fracture of rock inside the Earth, we would have to say that the process of fracking definitely creates many small earthquakes. These small earthquakes are generally too small to be felt and are not (so far?) the earthquakes that have been considered the big problem in terms of causing structural damage or injury. However, part of a fracking operation involves the use of high volumes of water to release natural gas from dense rock, and disposing of the associated wastewater involves injecting it into deep rock formations. That wastewater injection can “induce” or “trigger” earthquakes in faults that have been dormant (and might have otherwise remained dormant) for a very long time. These wastewater-injection induced earthquakes are not necessarily so small, and can be damaging. And that is (so far?) where the fracking/earthquake problems and controversies lie. There are well-documented cases of earthquakes clearly associated in time and space with fracking operations. But it’s not really the fracking itself that is the most likely source of damaging earthquakes. It’s the disposal of fluids via injection of highly pressurized wastewater into faults that more likely tends to induce the larger, potentially damaging earthquakes. Most earthquakes associated with fracking operations have been smaller than magnitude 3. But a few larger and damaging earthquakes are suspected of having been induced by the injection of wastewater from natural gas (and also oil production) operations. 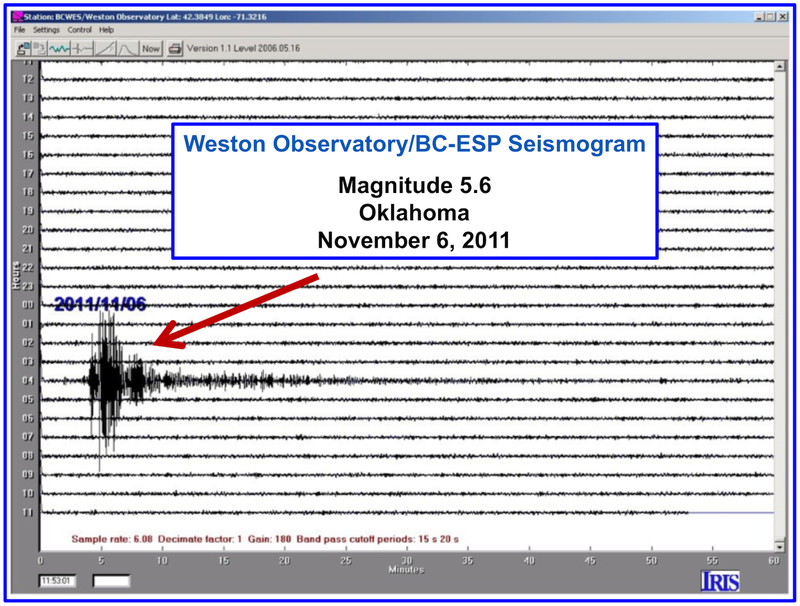 On the seismogram shown below, you can see the Weston Observatory/BC-ESP recording of a magnitude 5.6 earthquake that occurred in Oklahoma on November 6, 2011 and is suspected of having been induced by injection of wastewater from oil extraction. Although that earthquake has not been directly linked to fracking, the injection of wastewater from oil extraction is essentially the same process as what occurs in fracking operations. There is a well-known theoretical explanation of why injection of highly pressurized wastewater into faults could induce earthquakes. The increased pore pressure along the fault effectively lubricates the fault, causing it to release stress that might have been building up for many years, but might not have slipped without the excess pore pressure. Out of many thousands of fracking operations, and the associated disposal of wastewater, so far only a small percentage of those operations have been clearly identified as being related to induced earthquakes of any significant size. The majority of operations have not, so the probability of a given fracking operation inducing damaging earthquakes is probably quite low. Just how large and damaging a fracking/wastewater injection-related induced earthquake could be remains unknown. Although such earthquakes are generally smaller than magnitude 3, and the largest earthquakes claimed to be fracking-related are less than magnitude 6, even larger future earthquakes can not be ruled out. More research on this topic will be necessary to answer the question of just how big future wastewater injection-related induced earthquakes might ever be. There are many other environmental issues related to fracking, such as heavy truck traffic and contamination of nearby well water used by local communities for drinking water. These are important issues to consider regardless of the question of whether or not fracking operations induce earthquakes. Bottom line for me: These kinds of things are complicated. I think a more relevant question than “Does fracking cause earthquakes?” is: Given that wastewater injection procedures associated with fracking operations can induce earthquakes big enough to cause damage in some (small?) percentage of cases (and that there are other environmental hazards associated with fracking), what should we do about it? Fracking provides new sources of natural gas that could enhance our ability to generate electricity, heat homes, and provide fuel for transportation. Given the uncertainties, how do we find the right balance to make informed decisions about the extent to which the risks associated with fracking, or with any other process for finding new sources of energy, are worth the benefits? This is the challenge for all of us as citizens of planet Earth. For an excellent, more complete, analysis of the situation, see the USGS Science Feature article Man-Made Earthquakes Update, and follow the links in it. This entry was posted on April 12, 2018 at 10:15 pm and is filed under Uncategorized. You can follow any responses to this entry through the RSS 2.0 feed. You can leave a response, or trackback from your own site.